Fly to the high peaks of the Altai and explore its mountains and lakes on the road … Meet the eagle hunters of Kazakh origin, who inhabit the westernmost region of the country, and feel the wilderness surrounding you while escaping the prison of modern civilization. 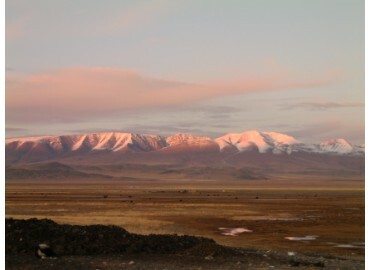 We start our journey at Ulaanbaatar, the capital city of Mongolia, where half the population of Mongolia lives. First we’ll visit Gandan Buddhist monastery, the most active religious monastery in the country where many faithful believers come from all over the world. Then we continue our exploration of Mongolia’s history and culture by visiting the National History Museum and Sukhbaatar square where Parliament meets and where the Great Chinggis Khaan statue is located. Finally, we conclude our city tour by having a traditional cuisine for dinner at a famous restaurant and spend our first night at a hotel. Next we will go to the western border, here we are at the heart of Kazakh and Muslim ethnic groups. 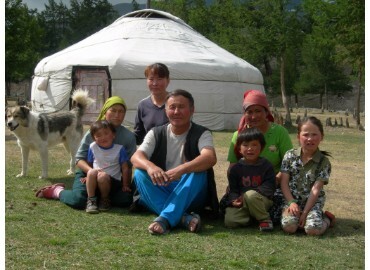 When you visit one of the local families, you might notice the uniqueness of the yurts. They are taller and more spacious than all of the other yurts in Mongolia. You’ll admire their interior and exterior designs that is only found in very few Arabian countries. You can explore the city’s sights and attractions, such as local markets, craft stores, and you can visit traditional clothing stores which have clothes from various ethnicities. Have a lunch and dinner at a local canteen, and spend the night with a local family. Altai sum (130km / ± 4h30) The Next day, we will drive to a small piece of the Altai sum. We will be camped on a high plateau on the steppe, alongside a river, surrounded by snow-capped peaks and populated by Kazakh families. 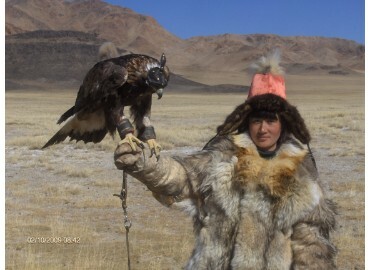 A traditional Kazakh eagle hunting family will host us in their taller, wider and more richly decorated yurt. They are so kind and hospitable. They will treat us like one of their own family members, so you can feel relaxed and at ease. We will have a lunch and dinner with the host family, and stay overnight. Achit Nuur (225km / ± 7:30) The largest freshwater lake in Uvs, Achit Nuur offers you stunning sunsets and sunrises with amazing fishing opportunities. This biosphere reserve is classified by RAMSAR has a great ecosystem of bird life: wild duck, goose, grouse, partridge, pelican… We’d advise you to bring mosquito repellent to protect yourself from mosquitoes during the summer. We will have a picnic for lunch, and camp overnight. Khovd sum (40km / ± 1h) Khovd is a sum of the Uvs province and is our third day in the Uvs province which is closest to the Russian border. We will visit the Khovd sum and go to the local museum to experience the life of herder families and to see their traditions. We will have a lunch in the steppe, and spend the night in a yurt. Goojuur Falls (60 km / ± 2:30) The next day we will explore one of the unfamiliar and unique water falls of the Shiver River called Goojuur Falls located on the course of the Shiver River Falls. It shoots water up twenty meters high in a backdrop of tranquil hills, high mountains, plateaus and massive stone massifs. We will have a picnic in the steppe; and camp overnight. Shaazgai lake – Khovd (60 km / ± 2:30) Then we will take a walk and enjoy the beautiful scenery around the falls and the shores of Shaazgai Lake, meaning “pie” in Mongolian. The lake’s water is famous for its sodium carbonate content and mud treatments. Have a lunch and dinner in the steppe; and sleep overnight in a local family’s yurt. Next we’ll leave for Uureg Lake, a large and beautiful salt lake, surrounded by stunning 3000m plus mountains. The lake is great for swimming; and locals say there are plenty of fish. Birds also like the location; and farmers bring their cattle once a month to drink from the saltwater. We will eat lunch and dinner in the steppe; and camp overnight. Ulaangom (90 km / ± 3h) On the way to the capital of Uvs province, we find a large population of diversity: Khalkha Mongols, descendants of Oirats, Tuva shamans or Kazakh minorities. We’ll approach the richness of the region and see its monasteries and local markets. Have a lunch and dinner at a local canteen and spend the night at a local hotel. Ulaanbaatar (internal flight / ± 4:00) Finally we will fly back to Ulaanbaatar, do some shopping and buy some souvenirs such as cashmere and garments well-known for their beauty and quality. Then we’ll end our last evening with a magnificent show of traditional songs and dances, and dine together at a nice restaurant. We will stay overnight at a hotel. Drive to airport Have a safe flight. End of the tour.